My SCUBA Diary is a free, lightweight logbook to manage your dives. It is ideal for anyone who prefers simplicity and efficiency over complex features and functions. Designed to minimize distractions it only include features that a recreational diver really needs to keep memories alive. My SCUBA Diary imports dive data directly from your dive computer. It can also import any existing dive logs from Suunto Dive Manager. 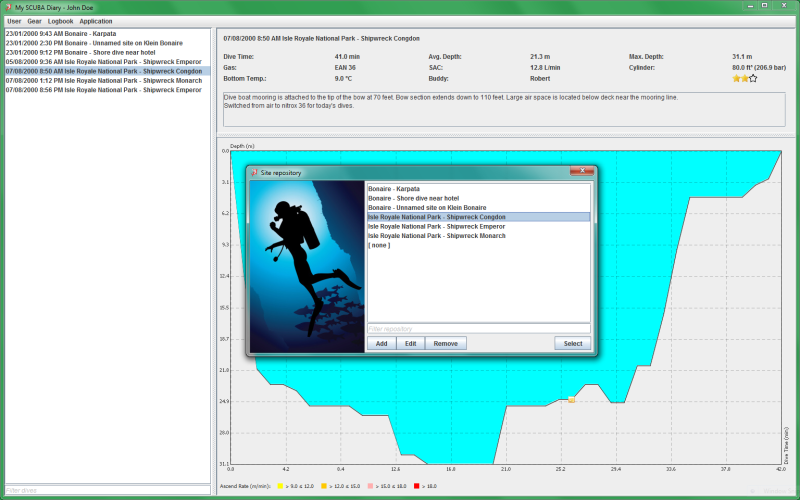 The application is giving you freedom of choice in how you display and export your dive information. The logbook supports multiple units of measure and date formats. All data can be printed out or exported to PDF in several page formats using customizable HTML templates. Besides that, My SCUBA Diary provides rating and search capabilities that let you filter and find your dives based on multiple criteria. It also calculates a variety of statistics, including SAC rate trends, for any selection of items from your logbook.